Some cover, eh? It's Vogue Knitting magazine Winter 2007 issue, and if you couldn't guess, I have saved the best for last. But first, the web site. Here, Vogue is not the best, but also not the worst. The site was unexplicably shut down for weeks and weeks recently. Now that it's back up, I can't see any improvement or even any change. The site is graphically clear (unlike Knitter's) and easy to use. It lacks a complete gallery of design like that of Interweave Knits, but, like IK, it offers both free and pay patterns. The free pattern section is not as extensive as the combined offerings of IK and Knitting Daily, but the pay patterns are better: juicy vintage designs from the 25 year history of VK magazine. The site also offers a knitting stitch library and support for both technique and design. Although the latter offerings are few, they show an analytical approach that is unique to this publication. For example, both online and in its pages, VK offers a "sweater map" pointing out the construction features of a complex knitting design. Also online are some terrible podcasts (I'm not such a fan in general) and the charts and schematics missing from the magazine's pages. This last feature is a fault, requiring the knitter to have online acess in order to complete some of the designs. As I'm on the subject of websites, this is a good place to note that Laura read the previous post on Knitter's magazine and pointed out that the publisher, XRX, was actually one of, if not the, first to use the Internet in conjunction with its magazine. They started one of the first knitting forums, Knit U in the late 90s. I had totally forgotten that and stand corrected. I still maintain that they have not kept their website very useful for readers. 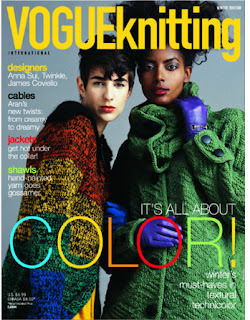 Vogue Knitting begins its feature section with the usual product, book, website, and yarn reviews. VK is the only winter issue to note the passing of Mary Walker Phillips, author of Knitting Counterpanes and Creative Knitting. VK is also the only mag to pick up on rumors of the reissue of June Hemmons Hiatt's Principles of Knitting. They actually interview the author who confirms that she is revising the book. That is BIG news. Other features of interest and unique to VK are the profile of a local yarn shop (in this issue Why Knot Knit of Atlanta and North Carolina) and VK World, which looks at international developments. This issue of VK has four major articles on technique. For comparison, IK has one, and Knitter's has none. VK features its usual offering from Meg Swanson, this time a great article on how to make her mother's (EZ) Pie Are Square shawl. Others are how to knit in a spiral by Nicky Epstein, sleeve length by Lily Chin, and an analysis of four types of lace patterns by Shirley Paden. I would say that this is dynamite content, all by masters (mistresses?) of knitting design and technique. 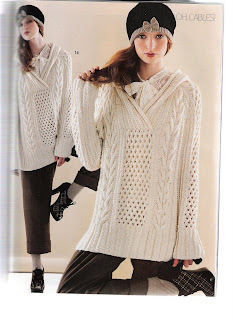 The Winter 2007 issue of Vogue Knitting contains 32 patterns plus an additional 8 as a special advertising feature published on the website. Of the 32 patterns in the magazine, 22 are sweaters, 8 are shawls/wraps, one is a hat, and one is a scarf in a matching set. It is harder for me to review the VK patterns than those of the other mags, not that I like them all, but because the design standards of VK are higher, making all of the designs (with a few exceptions) credible. In contrast, IK is weaker in design crediblity because they run too many patterns that are awkward or unwearable in some way. Knitter's loses credibility through sheer wrongness. You might say that this last is a matter of opinion, but in some instances, I think the majority of knitters would agree. Given the higher standard, I think the shawl section of this issue is the weakest, although props for featuring shawls in the first place. Most of the designs are uninspiring. There have been so many incredible shawl patterns all over lately, and I think IK actually tends to do them the best. Of the shawls, I would say that Nicky Epstein's spiral(#1) is the worst in that it's kind of clunky in a too chunky yarn. I like pinwheel shawl best (#4). It is similarily constructed to #1 out of individual motifs. It buttons, and is pleasantly atypical. Of the sweaters, there are so many and so many interesting patterns that I don't know where to begin. Of the cabled sweaters, let me note that #10 has ridiculously belled 3/4 sleeves and that #9 is awkwardly long. But of the 5 cabled sweaters remaining, all have something to recommend them. Sweater-dress #11 is very distinctive. I couldn't wear it, but it sure is interesting. The partially closed round yoke cardigan by Shiri Mor (#13) is not bad, but I myself am tired of round yoke cabled designs. They are all over. Two designs by Vladimir Teriokhin (#s 15 and 16, especially the latter) are sure fire winners, as are most of what comes from this new Norah Gaughan. The hooded outerwear tunic (#14 pictured below) is receiving some attention on the Ravely Vogue Knitters group. Shirley Paden's two jacket designs (#s 17 and 18) are just my style - short, fitted, classic, but similar tailored cardis (#s 21 and 22) could appeal more to younger knitters. What is it with puffed sleeves though? There are two puffy sleeved designs in this issue (22 and 28). Is is because I wore this trend when it was around before that I can't get my head around it now? The two cover coats are very cute, although I could loose the color blocking on # 26. Finally, on the good side, I think I would actually make and wear the colorful and odd dress designed by Brandon Mably (#30), although I might lengthen the sleeve to 3/4. It is very hard for me to nominate a best for this issue because I think so many of the designs are good. I am tempted to name the Brandon Mably dress above, but that would be an eccentric choice. The thing is that colorwork like this and like the Eunny Jang design in the Winter IK is starting to look fresh to me after years of variegated and novelty yarns. For a more popular choice of best design, I would probably choose #14, the photo above the Mably dress. Worst designs? That's easy. See the two photos below. I think the chrocheted color-blocked coat is worse than the Twinkle tunic. The Twinkle design might look good on someone, but it's a little silly. I have never been partial to Twinkle. My Vogue addiction began many years ago with their sewing patterns and magazine. IHMO Vogue cannot be beat for design and technique. For some reason I never knew they had a knitting magazine, only learned of it recently. I was gifted with a copy of their Holiday issue and was greatly impressed. This review series has been fun! I actually don't much like Vogue and am not going to resubscribe, so it's interesting to me to learn that it's your favorite. I've only ever seen a few designs in VK that I wanted to make, and I am put off by the way their shoots are styled. I was surprised you liked VK best. Last year I let my 2 decade+ subscription lapse. With the exception of a few issues, they are all in my attic gathering dust. I will concede the articles are the best and I always enjoyed EZ and Meg.